Page Builder allows you to organize your images and photos into categories by creating galleries. Click Advanced Modules in the right sidebar. Click the Gallery button and drag it in a single, smooth action to a place on the page. Media Library Click one of the Add to Gallery tabs. Click on the images or photos you want to display in the gallery. SmugMug Insert SmugMug RSS into the Feed URL field. For more information on finding the RSS feed, see Share my photos. Click Add To Gallery, located on the bottom right hand corner. Use the remaining fields in the Gallery Settings dialog box as needed. 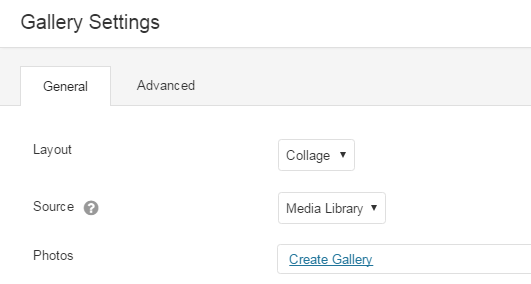 If you want to make changes to your gallery in other ways, see Change gallery settings using Page Builder in WordPress.